With resistance to heat and chipping, Alnico magnets are known for its mechanical strength. But they also have a tendency to demagnetize more easily. The magnets are used in a wide variety of products, including various meters and communication applications, integrating wattmeters, and security devices. 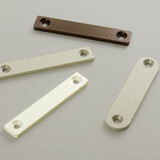 Resistant to heat and rust, these magnets are suitable for medical instruments and sensor components. Perfect for manufacturing small and intricately designed magnets.